University of Washington students coordinated 5 powerful, articulate speeches before the Board of Regents meeting today in a passionate call to divest university funds from fossil fuel investments. 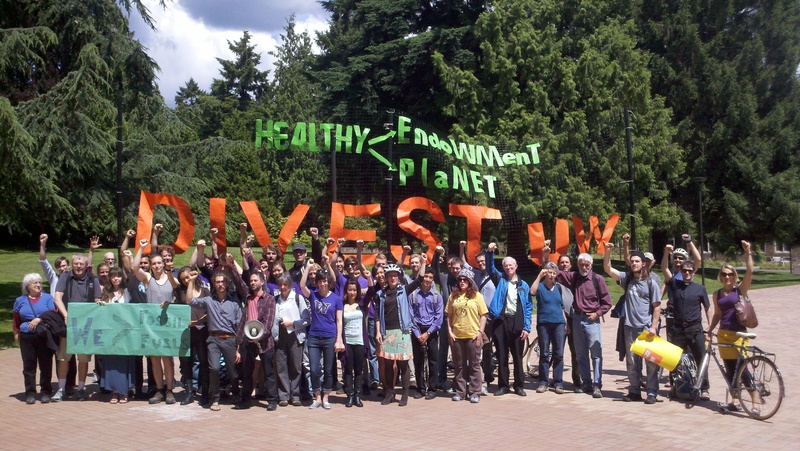 The City of Seattle has pledged to divest its holdings, along with dozens of cities, churches, and colleges, leading the way for over 300 other institutions where divestment campaigns are gathering momentum. Two days ago San Francisco State University announced they will divest. The divestment campaign at 350.org is growing rapidly as the morality of investing in these planet-wrecking corporations is clearly unforgivable. How can we invest money for retirement, or build universities, knowing that the return we made on carbon fuel stocks to live comfortably now helped push the planet over the tipping point and committed my children to a life of suffering? Find out more at gofossilfree.org about how you can get involved in leading and supporting these campaigns to move money out of fossil fuels, hold rogue industries accountable, and invest in a clean, livable future for our children. The UW students are showing us the way. Now it’s our turn! Posted on June 13, 2013 by fostertudePosted in Calls to Action, Climate Change News, For Parents, How to Get Involved, Local Events, Things You Can Do, UncategorizedTagged 350.org, divestment, fossil free, UW.